BRIT WORKER IN TROUBLE IN ABU DHABI DOO FOR ‘INSULTING ISLAM’…….. – The Tundra Tabloids……. 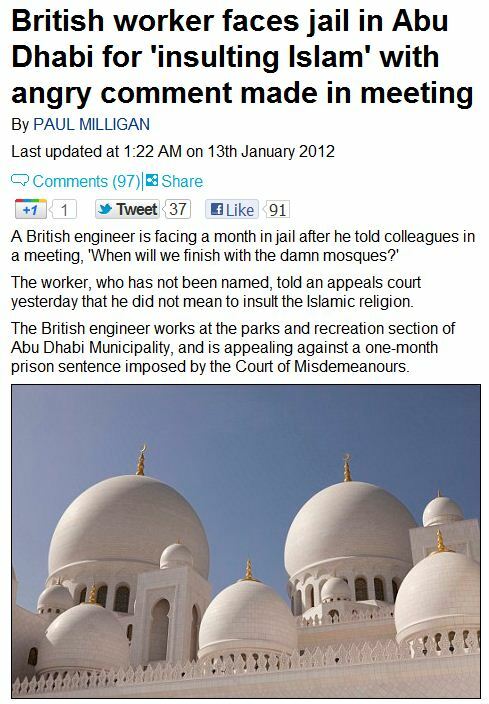 BRIT WORKER IN TROUBLE IN ABU DHABI DOO FOR ‘INSULTING ISLAM’…….. He was in charge of a project to create gardens around a mosque, reports The National, an English-language publication based in the capital of the UAE. The engineer told the court he lost his temper during a meeting because the project was progressing slowly. He was then reported to the police by his work colleagues for asking the offending question. He explained to the judge that he did not mean to insult the mosque as a religious place and that he respected Islam and the UAE. ‘I said it out of concern for the project because I wanted it to be ready as soon as possible,’ he said. The engineer reasserted his respect for mosques he works on and said he wanted them to be presented in the best way possible way. A decision on the appeal will be announced on February 7. The conservative UAE has a history of cracking down on the many foreigners who live there for indecent or ‘un-Islamic’ behaviour. Next Post Next Post IRANIAN HUSBAND ADMITS HE MURDERED HIS WIFE, BOTH CONVERTED TO CHRISTIANITY YEARS BEFORE……..
What a crock of crap! Let’s turn the situation around, with all of the ‘followers of the teachings of the prophet this includes Imams, religious police, the political class and the steert corner rabble rousing hate preachers’ delivering hate filled rants and demagoguery adnauseam, there would not be enough money on this planet to pay the fines, or prison cells to fill with violators of ‘cursing, defaming, or insulting Infidels. When it comes to many Muslims it’s always their way or no way.